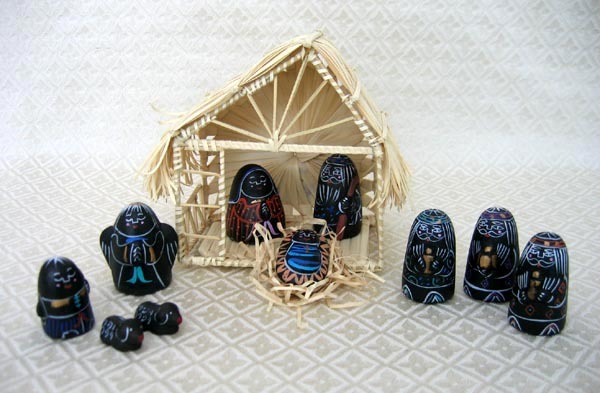 This 10-piece Nativity set was made from clay by children who were living on the street in Ho Chi Minh City, Vietnam. The thimble people are approximately 2 inches tall. The set includes the Holy Family, three wise men, an angel, a shepherd, and two sheep. The set comes with a straw hut, which measures 6 inches wide by 5.5 inches high. Mai Handicrafts is a program for street children in Ho Chi Minh City. Started by a small group of social workers, Mai Handicrafts originally worked with poor and neglected children who could not go to school due to lack of legal papers and inability to pay tuition. Mai Handicrafts gave them work and encouraged them to attend informal classes. Now that all children are admitted to formal school for free, Mai Handicrafts provides work to their mothers and older sisters to improve family income and well-being. During recent years Mai Handicrafts has established itself as the primary marketing agent for these neglected families and women. In a developing context, it also practices a model of social development in which social service cannot be separated from economic self-reliance.